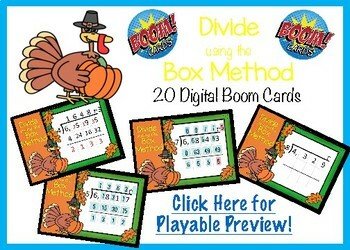 Boom cards are digital task cards that are great for math centers, homework assignments, and even quizzes! No printing, laminating, or cutting required! These task cards are designed for students learning the long division process using the box method. With this deck of 20 self-checking task cards students can build confidence and work on a variety of problems to master this skill! Students will be able to fluently divide with one digit divisors. Boom Cards play on modern browsers (released in the last three years) on interactive whiteboards, computers and tablets. Boom Cards apps are also available. When you redeem your purchase, Boom Learning opens an account for you if you do not already have one. For TpT customers new to Boom Cards, Boom Learning will give you a FREE, 3-month trial. Starting January 1, 2018, the free trial will be 150 students for 3 months. At the end of that year, you may renew or choose not to renew. If you do not renew, you will be able to continue using Boom Cards with the Fast Play feature. Fast Play does not track individual progress.